When you place the DVR in a lock box the vandal target becomes the wires that exit the lock box. 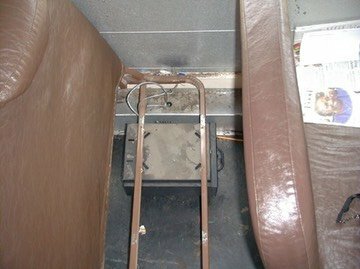 It would have been wiser to rotate the lock box mount 90 degrees and have the cables exit directly into the sheet metal, so there is little chance for a child to mess with them. The best value in school bus cameras, digital bus video cameras, vehicle camera, digital in-car video cameras, mobile video surveillance systems is 100% Solid State digital like the SD4m or SD4 series. The DVR is tiny and does not require a large bulky lockbox to protect it.